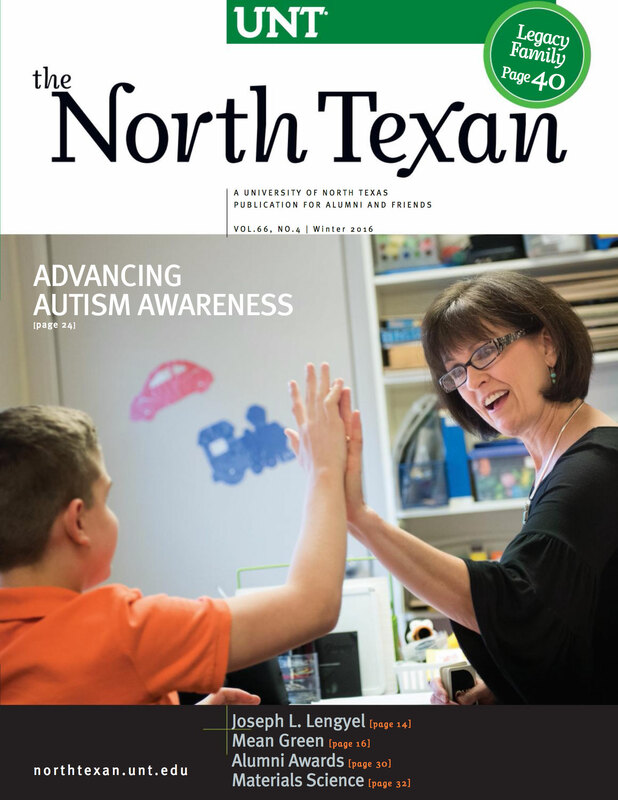 Alumni are using clinical and behavioral techniques as a piece of the puzzle in understanding those with autism. UNT remains focused on academics, research and athletics. Alumni are making a difference by engineering and improving the use of materials. The ROTC cadet reached the National Guard's highest rank -- and the Joint Chiefs of Staff. UNT alumni share memories as students from the class of 1966. The Mean Green football team to play at the Zaxby’s Heart of Dallas Bowl Dec. 27. UNT alumna Paula Waggoner-Aguilar helps small companies compete in the energy industry. UNT alum Adam Hasley turned globetrotting dreams into budding career as executive in China. With new leadership and success this season, the Mean Green chart a course for the future. UNT associate professor Ian McGuire's murder mystery, "The North Water," wins acclaim. UNT alum and wife visit from Thailand to see mentor and support Mean Green football team. UNT alumna Sara Ivey draws on education as producer of "Murder Made Me Famous." UNT alumna Maren Morris wins country music high honors. Besides many lifelong friends and teachers at North Texas, I most remember my piano professor. What's best -- a capsule wardrobe or a colossal closet? UNT alumna Tamar Navama's jewelry appears during New York Fashion Week. Alumni who won journalism's highest honor discussed their work. Roommates revisit their old dorm. The UNT Alumni Association offers memberships as annual or lifetime commitments. UNT alumna Michelle Gillaspie works pyrotechnics at Disney World. Remembering kindergarten lab school to college. Doctoral student Renee Cloutier studying how social anxiety affects teens' use of drugs. UNT associate professor Haifeng Zhang is part of team that won major grant. UNT alumna Danielle Artis loves performing in the circus. UNT students visited Rennes, France, to learn about the city's history of crime and punishment. UNT seniors win 2016 Fall Texas Intercollegiate Forensic Association Championship Tournament. David Mason received the 2016 Eminent Faculty Award. UNT student Sanderia Faye wins honor for her debut novel. Media Arts students win awards, and viral video lands third-grader acceptance to UNT. UNT history professor Richard B. McCaslin explores community where Texas' beginnings took root. See how our beloved mascot shares the joy and wonder of the season in UNT’s 2016 holiday video. TAMS student Prateek Kalakuntla makes mark in STEM competition. Grammy-winning alumna Norah Jones receives big honor, visits with students during a trip to Denton. UNT alumnus Steve Wiman makes career out of creating art from discarded items. Watch a video from “Mean” Joe Greene about what makes UNT a special place to call home. UNT alumnus, saxophonist Tim Ries visits music students. UNT associate professor Ipsita Chatterjee studies culture and economy of globalization. UNT opera alumni perform together in "Cinderella" for the San Diego Opera. UNT alumnus Henry Hey serves as musical director for "Lazarus," one of David Bowie's final projects. UNT alumni Inducted into African American Education Archives and History Program Hall of Fame. UNT's Green Brigade Marching Band reunites for football game. UNT has been a tradition for three generations of Liz Millender Grant's family.